This is the best campaign poster of this election season. It's not everyday I reach a new low ... but ... :/ This is pretty much how I feel about this election season. aww, sad salty little cruz cuck. Make a bag of cruz boogers, since that what El Rato prefers to eat. Truth of the matter is, you know more about a man by the enemies he has than by his friends. So who’s against Trump: RNC, DNC, The corrupt media, The (one world gov) pope, George (nazi collaborator) Soros, China, 98% of Washinton DC, all of the Regressive Left. He could retire and live like a grandiose king, instead he’s on a 1 way suicide mission to save this country. Sad thing is, (8/30/2016 6pm) Drudge is now putting up the writing on the wall: Homeland Sec to take over elections and Electoral college can place anyone as President should one of the two die, they’re writing this because they want to stop Trump and hand the US over to the globalist. As I’m writing this bama’s going to hand the internet over to the UN in October, mass censorship coming. Google or youtube search: “Ted Cruz Hidden Hand,” he’s a Bush Acolyte and pretty much would end up being a right-wing Bama if he were able to make it to the White house; because they both have the same bosses. wait what? ‘for ever and ever and ever and ever’? Aww back at you. Apparently you can’t see too well. Where or under what rock (where I am sure you crawled up from) are boogers chalk white? Ted Cruz simply chewed a mint before the debate and one dastardly little uneaten crumb managed to find it’s way to his lip. How I know this is my business but really, 1st graders name call folks “booger eaters” while adults prefer to discuss policy. Your guy is a gutless, feckless, and obviously dickless bully that hates himself so much because he was given a few physical shortcomings that he feels the need to build gigantic towers with his name all over them..and he will screw you on every “promise” that he’s made. Yes, with his latest immigration flip flop we see who the real cuck is now don’t we. Trump and his merry band of cuckless trumpidians, history will indeed speak very ill of you and your ilk. Well your name is appropriate. Will be interesting going over all the salty posts and predictions by Trump haters after America comes back from the disaster known as the Obama Era. Who new such tolerant people, at least they claim to be, could have so much hate. Oh the irony. 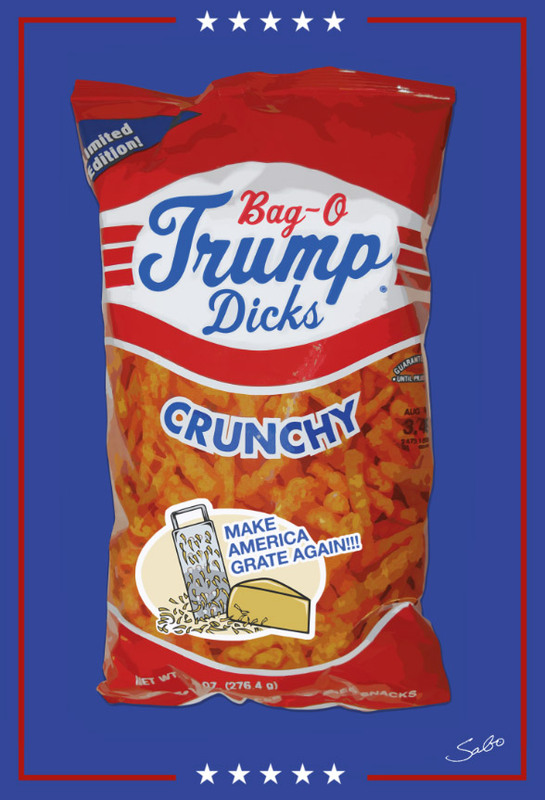 Sabo, you make great work. I will be getting the Trump giving the finger poster soon. TRUMP WASN’T MY FIRST PICK BUT HE WAS A DAMN SIGHT BETTER THAN HILLARY BY A LONG MILE. I PRAY HE DOES WELL. HE HAS MY SUPPORT. Everyone who doesn’t want president Hillary needs to vote for Trump. I wanted Cruz to get the nomination, too, but that didn’t happen and there’s no point in griping about that now. At this point it’s a 2 way choice. We’re going to get Trump or Hillary. Take your pick.